Here are some interesting facts I found about this trecena: 1-Caban. World War II broke out on 9-Chicchan, when the Nazis invaded Poland on September 1st 1939. Another notable, although less known world event that took place on 9-Chicchan was the launch of Apollo 13 (11 April 1970 at 13:13). That was the mission NASA called “A successful failure”. The same mission which Hollywood and Ron Howard (13-Ahau) turned into the movie by the same name. Likewise, in this very trecena we can also find the beginning of WWII on 9-Chicchan, and VE-Day on 4-Ahau. Now what’s the connection between WWII and NASA? You might have heard about operation Paperclip, when US intelligence were smuggling German rockets scientists to the states. These scientists were the core staff that began NASA, headed by the first director of the Marshal space center: Wernher von Braun (9-Ik). Saturday, 24 October 2015 (1-Caban). In the above quote J.D. Salinger says that happiness is a solid and joy is a liquid. Now, what on earth could that mean? Solids can decay, they are eroded by liquids and gasses. They can fall down and fracture. Some solids freeze and defy time. Some solids are the stuff I purchased in the market; the seat of my vehicle, my keyboard’s armrest. Solids are also the hills and valleys surrounding my neighborhood, my front door handle, the pavement that leads to the recycle bin. In other words, as far as consciousness is concerned – solids become background at some point. Like a wardrobe or a used car, they can be a source of what’s called boredom. Solids require either replacement or personal maintenance to hold my attention. Does all this apply to happiness? Liquids seep into solids and flow. Liquids must be properly contained to be used as a stable resource, like a gas tank or a coke bottle. On the other hand, contained liquids also tend to fester, so liquid must be circulated in order to remain fresh and potent. Only on rare occasions contained liquids get better over time – like good wine and deep-colored honey. When unconstrained, liquids evaporate and precipitate. They cycle back and forth, and retain their atomic mass. According to the common arrangement of matter, liquids are the interim state between solids and gasses. Symbolically, this means that an interim or go-between state is dynamic by definition. Unlike the solid, it doesn’t break nor lose itself to fire – it transforms; it communicates without losing anything in the process. Does all this apply to joy? From further inquiry into the symbolism tied into this sun-sign, it is evident that Caban has a lot to do with the planet itself, as a living and evolving organism with its own heartbeat. The Earth’s heartbeat is ancient, deep, and very low in frequency. What’s so special about Caban is that no matter where I am on Earth, above the atmosphere, deep underwater, downtown in the city or by the shore – I am constantly connected to this all-encompassing deep frequency. Another interpretation of Caban is incense, which is related to thought in the Mayan tradition. Thoughts go up to the heavens like burnt incense, like evaporating liquid. Thoughts eventually precipitate down and manifest, when they complete their cycles of development and attainment. The second step of the world tour the Maya called 1-Caban is the mirror of reality and truth. It is essential to think true thoughts, so that they eventually materialize as true realities. But true to what? That is the question, as they say, and I have my own answer. Yours is different, naturally, but it must nevertheless be true to you, when you turn your attention to it. I think true thoughts look just like harmless thoughts, but can be insightful and maybe subversive nonetheless. True thoughts leave me empowered, emancipated, and on the move. These are thoughts that should also be reflective and somewhat humble so to remain within rebuke. True thoughts lead to true abundance for myself and my community, as displayed in the previous uinal (7-kan, then 7-caban). They are beyond envy and over competition. They lead to lasting solutions and to the eventual replacement of whatever no longer serves thoughts, nor inspires realities. Stage 2 goes well with the sun-sign Edznab (much like 7-Edznab); Edznab is the Mirror of Reality, and 2-Edznab is like looking in the rear-view mirror of the taxi right after leaving home on a world tour. 2-Edznab means that I face Reality the way I face a mirror of truth. It shows me what’s there and what’s only an illusion. Also, using another meaning of the word Edznab, a razor-sharp knife can be used to give life as well as to take it away. Both of these interpretations are consistent with the duality inherent to Edznab, stage 2, stage 7, and other stages as well. There’s a tender kind of sacrifice and camaraderie in the thought that I might give my life for my country, or for my family, or for some truth bigger than myself. That idea used to make much more sense to me back in the 80’s and early 90’s. It’s different now on the inside. It’s becoming different on the outside, too. Ned Beatty played alongside William Holden (both born 2-Edznab) in the 1976 feature “Network”. Curiously, there isn’t a single scene of them together. Holden plays Howard Beale’s old boss, while Beatty plays the Bilderburg-style overlord and puppet-master. After thought goes through a true mirror (2-Edznab) it must now elevate itself from a true thought to a purifying thought. Many thoughts are true, but many also reflect things as they are, rather than as they should be. Things as they are belong to the realm of experience, not thought. So, thoughts can be true but at the same time not covering any new ground – stating the obvious in different words; taking about the weather inside the head. (Reflecting back on the description of 1-Caban above:) a purifying thought is true AND new/refreshing/inspiring. It has the same essence as joy (liquid), rather than the essence of happiness (solid). Cauac is closer to the joy of learning than to the happiness of knowing. It is closer to taking a shower than to regurgitate what I read yesterday just to impress someone. A Rainstorm cannot be contained or controlled. It has total freedom to march wherever Purification is needed. This resonates with the activating and unhindered expression of Stage 3. A rainstorm IS activating and expresses itself freely and according to its own rhythm. Therefore, stage 3 goes well with the essence of Cauac. Spent most of my life doubting my belief, believing my doubts. My mind was so complex so it remained un-flexible. So why not try to simplify? Alright, here we are. Again. Another end-date to wrestle with, or maybe one to hug this time. 4-Ahau is not a day to be considered lightly, it has been the one day when (very-very) long-term cycles begin another lap around the galaxy. At the same time, 4-Ahau is also a relatively “weak” day, since there are 9 days to go in the 13-day trecena. It is a very stable, albeit rudimentary level of attainment. Considering a Tzolkin beginning 1-Imix, 4-Ahau is almost 3/4 of the way around. I’m going to discuss two major events in 20th century history that took place on 4-Ahau. Two significant dates in 20th century history took place on 4-Ahau: the allied victory over Nazi Germany (VE-Day, May 7th) in 1945, and the Apollo 11 landing on the moon (1969). The Tzolkin has gone around approximately 94 times since 1945, and 60 times since 1969. But who’s counting? Both events have inspired generations of scientists, engineers, politicians, and soldiers. They were finest hours, celebrated around the world. They shaped the destiny of countless souls, who sought to secure an exterior destiny for themselves, adding value and meaning to their respective lives. What is still called ‘value’ and ‘moral’ today is actually based on outdated guidelines, set emphatically by world events like the two mentioned above. Political and military values still draw substance and legitimacy from that one victory over absolute evil in Berlin. Scientific, technical and industrial values do the same with respects to NASA’s great achievement in the middle of the Sea of Tranquility. Click here to see part 3, where the landing actually takes place. Cronkite with his rare and famous removal of glasses. Later, there’s an interview with Armstrong (10-Chuen) and his wife Janet, done many years later. The young Mike Wallace (11-Ahau) and Bob Simon (8-Imix) are there, too. Their careers were fixed forever following that weekend broadcast. Armstrong died quite recently, and was buried at sea in due ceremony on 16 September 2012 (10-Ik). Personally, I identify the old mindset in this documentary in the way the astronauts are treated and respected. They are the “selected few”, the “cream of the crop”, and they possess the “right stuff”. Since July 20th 1969 (4-Ahau) every boy wanted to be an astronaut, or at least a pilot. And every girl wanted to marry an astronaut, or maybe an engineer. Those who would do neither, maybe just wanted a Green Card, since the US has officially become the one country where you can fulfill your dreams. How does that sound to you today? Even more than other Ahau days, 4-Ahau is considered to be a pivotal day in the Tzolkin. 4-Ahau means that various limits to my abilities, resources, and measure of intention focus are illuminated and clearly visible. It means that my expectations from myself and others are grounded (by 1-Caban) and pragmatic. 4-Ahau is a good day to contemplate a possibility that the most sought-after state of mind – enlightenment – is only the 4th stage out of 13. So, the ripe flower Ahau serves as the basis and stabilizing factor (4) of evolution’s unfolding on the global scale (Caban), and is developed further by 9 other rudimentary sun-signs. Right after a lion cub makes its first kill, even though it might feel elated and superior for 1 day – it has no guarantees whatsoever regarding what will happen in tomorrow’s hunt. Hence the term “King for a Day”. Tomorrow the cub might succeed, it might fail and go to sleep hungry, or it might parish in the attempt – same as always. This is the gift of opportunity and evolution that mother earth has equally bestowed on lions, hawks, grizzlies, daughters of Eve and sons of Adam. 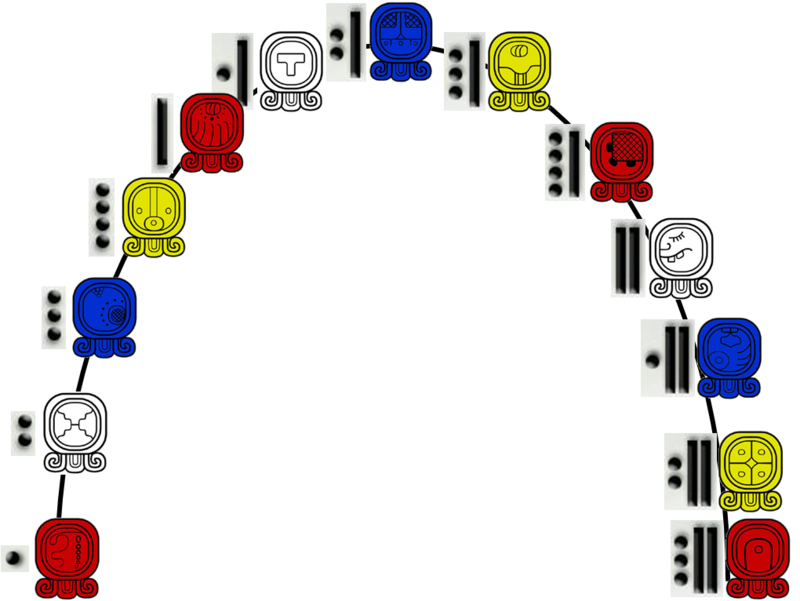 Like all Imox days, 5-Imix begins a new uinal of the Tzolkin, and empowers the Caban process of evolution by reminding me that yesterday’s enlightenment (Ahau) can serve as very strong infra-structure (4) to begin a new process of bringing about global, as well as personal – consciousness (Caban) back to square one (Imix) of my next common phase. Imix is the most rudimentary sun-sign in the 20-day uinal. It embodies the most raw forms of energy, and it includes ALL. Paradoxically, it is both the most physical and present aspects of creation, while being the element most associated with the dreamworld and the wispy unborn. It is mother earth’s primordial-swamp-level glory, as depicted by the proverbial sunrise. The Caban-oriented, heart-centered emphasis is on delicately balancing my focus (5) of consciousness between body/mind/spirit and practically everything else. The message of the new day which dawned yesterday must be spread throughout the earth. This is done by the primal power of the wind (Ik). Wind is the power of dissemination which is established in the uinal 2 days before seeds (Kan) come into play – the seeds that are disseminated by the wind. So the wind comes before the abundance that it is supposed to spread. It might wonder around aimlessly above mountaintops and over the seashore. Then it comes upon a vast, over-ripe sunflower field. This resonates with what Ian Lungold (12-Ahau) used to say (and I’m paraphrasing): The tools required today were provided yesterday. Airborne seeds in nature are the same as spoken ideas and comments in a network meeting. I listen, I comment, I joke around and talk around the lunch table. I am sowing seeds, using wind (or, more precisely: spirit). 6-Wind is a very gentle wind that never wishes to rock any boat. It negotiates and responds through the craft of speech. 6-Ik is someone needing someone else for whatever reason. 6-Ik is when the message of enlightenment as a basis for further evolution (4-Ahau) crawls from the swamp and goes global, on the wings of the wind. The midpoint of the Earth (Caban) trecena is 7-Akbal (Night), and it can be visualized as the Day/Night longitude line (the terminator), constantly dividing the Earth as it spins around its pole axis. There is always half of the Earth in light, while the other half is in night. In the context of this trecena, 7-Akbal means that the purpose for the universal heartbeat is constructive. Every invisible pulse that reverberates around the globe is built on top of all previous pulses. This pertains to the sun-sign Akbal since it also means “house”, in the sense of a structure that is based on bricks built one on top of the other. This trait is also evident in people born under the Akbal sun-sign. They are usually busy putting one brick on top of the other, so when you try suggesting something completely new, they sometimes find it hard to incorporate it into their elaborate structure. 7-Akbal means the sky will begin clearing soon, and around the beginning of 1-Oc the Sun will begin its hours of glory. There are no frontiers left on heaven or earth, no boundaries to maintain between us, nowhere left to run. Light is bound to dissolve all remaining doubts and second-guessing. His parting message was “courage”. Courage is in high demand when facing the unknown. It is the message of Akbal. On this logical voyage through 1-Caban the sign of basic abundance (Kan) is multiplied to infinity by the 8th stage. To begin the second leg of the trecena trip, a global community – a network of souls – is gathered today by the net known as Kan (a.k.a. Kat). On a different plane, on 8-Kan the seed balances the Earth (Caban). Seeds that fall to Earth make the first step in finding their destiny as a plant in the making. They form a new harmony with the earth and create a new equilibrium with it. The place where there are no seeds on the ground is known as the wilderness. A piece of mother Earth laying in wait. In a sense, 9-Chicchan is like a near-death experience. It’s true that this sun-sign is always immediately followed by Cimi (death), but on 9-Chicchan this nearness is highlighted by the divine and intense 9th stage . Life is what drives the planet towards manifestation. It synthesizes whatever’s already manifested and produces a new drama every day. On 9-Chicchan I utilize my vital resources to complete all cycles of action. As mentioned above, World War II broke out on 9-Chicchan, when the Nazis invaded Poland on September 1st 1939. Another notable, although less known world event that took place on 9-Chicchan was the launch of Apollo 13 (11 April 1970 at 13:13). So we have in one trecena the first successful Apollo landing on the moon (on 4-Ahau) and then one of the most famous mishaps of the same program (today, 9-Chicchan). Likewise, in this very trecena we can also find the beginning of WWII today, and VE-Day on 4-Ahau. On 10-Cimi the world is transformed (terra-formed). The change is apparent, and what made it appear is the accumulated result of all the undercurrents of past phases of Caban – the planet’s heart. 10-Cimi is the perfect time for me to complete the cycle of change that I’ve underwent while corresponding with You and move on to something “Same-Same, but Different”, to put it in India’s English. After the manifested change 10-Cimi, 11-Manik provides the tools and skills for perfecting the change; for integrating the newborn consciousness of the young with the older, established consciousness of past cycles of evolution. 11-Manik facilitates the change and smooths over rough edges with careful attention to details, and a firm intention to heal past wounds and forgive. This renders revenge and spite irrelevant. A new page is turned. In addition, Manik has an inert driving force that propels it constantly onward – what’s next to learn? what new experience has this Earth in store for me? This following number never fails to lift my spirits. Whenever the devil comes down to sit on my shoulder I remember I’m the best that’s ever been. Manik does that to me. I forget about fear. She soothes me every time. In order to understand the Earth out of which I came, I require a star’s perspective. From the depths of space the star’s light makes its cosmic way to cross the threshold of my eyelids. I see it among a multitude of stars. I connect it to other stars in a particular way. I make up stories about that star, and about its neighbors. However, from the star’s perspective there is a different story. The star has different neighbors than the ones I see. His story is about my Sun. He connects it with suns I might only visit for dinner in my deepest dreams. From the apparently slowest flowing Eastern sun-sign (Caban) we arrive today at the most dynamic of them (Muluc), and come full circle on the global tour of the planet. From the solidity of happiness comes the fluidity of joy. By a determined intention of sincere service to the other, and by an equally sincere offering of my own skill and talent – the planet constantly ascends to higher and higher levels of evolution. This communal and reciprocal principle has been gaining a lot of ground in recent times across the world. It is the link to the next lesson in the tzolkin round – a lesson of love and loyalty: 1-Oc. I’ve had glimpses of what’s to come, like small pearls in the mud. Song lyrics, insights shared with friends, slow contemplation of my breathing. These came through a heart connection. After taking root, I thought about these glimpses. My thoughts went in many directions and converged back to reality. I use words to think and to communicate. I stop using words sometimes. I stop thinking. This stopping habit has been happening more frequently recently. When thought begins again it’s more cautious. Thought picks the right words this time to retain focus. Thought doesn’t wander off to memes it doesn’t wish to manifest, like calamity or fear. This type of discipline helps me to tell truth from false. When I begin turning attention to the solar plexus thought goes to sit in the stands and enjoy the glow. The sun is simple, it’s benevolent beyond my ability to ever repay. This is 1-Caban, known as the global heartbeat. It’s when 4-Ahau takes place. The question of solidity vs. liquidity is at the heart of the period beginning today, 1-Caban. In the above quote J.D. Salinger says that happiness is a solid and joy is a liquid. Now, what on earth could that mean? Right after a lion cub makes its first kill, even though it might feel elated and superior for 1 day – it has no guarantees whatsoever regarding what will happen in tomorrow’s hunt. Hence the term “King for a Day”. Tomorrow the cub might succeed, it might fail and go to sleep hungry, or it might parish in the attempt – same as always. This is one of the gifts mother Earth has equally bestowed on lions, hawks, grizzlies, daughters of Eve and sons of Adam. Imix is the most rudimentary sun-sign in the uinal. It embodies the most raw forms of energy, and it includes ALL. Paradoxically, it is both the most physical and present aspects of creation, while being the element most associated with the dreamworld and wispy unborn. The emphasis is on delicately balancing my focus (5) of consciousness between body/mind/spirit and practically everything else.